How to Throw Your Child a Fun, Budget-Friendly Birthday Party It’s something children always look forward to — a day all their own! Most children clamor for a birthday party each year to celebrate their big day, but sometimes a party can be hard to pull off without spending a lot. If you want to reserve the bulk of your budget for presents, or money is simply tight, you can still give your little one the party she deserves. Check out these ideas for throwing an easy and fun birthday party at home — all without breaking the bank! Spend Wisely While we may want to shoot for the moon when it comes to our children, we also need to be sensible. If planning ahead is your thing, try to to buy supplies well in advance of the party; this can help spread out costs throughout the year. For example, you can usually find discounted party supplies after major holidays, some of which may be themed, though many will be multipurpose. Also, work with what you have on hand. If your child loves soccer, have a soccer-themed party and encourage other children to dress in uniform. Don’t forget to check out bargain stores either. Dollar stores are a great resource for inexpensive party supplies. You can also save a little extra money by emailing your invites rather than sending physical invitations. Get Creative with Food When it comes to the food, you can save money by supplying it yourself. Schedule the party after lunch but before dinner to avoid having to feed everyone a meal. Instead, get creative with colorful snacks like fruit skewers, homemade dips with pretzels or chips and simple sliced sandwiches. If you’re inviting lots of guests, you may want to skip buying the cake and make it yourself. If you are not the best baker, a few boxes of cake mix can go a long way toward cutting costs, especially when paired with pre-made frosting. Ask a friend who may be better at decorating for help if you’re really worried about presentation, but kids will probably be more excited about eating cake rather than what it looks like. Plan Your Games If your child’s birthday is during a warmer season, hosting a party at home is a cinch. There are plenty of games kids can play outside and often they will take care of the fun themselves. It’s good, however, to have a few ideas in mind to get the ball rolling. Freeze tag followed by Simon Says can be a fun way for kids to run around. You could even set up your own basic obstacle course using items you already have in the house. If it’s warm enough, you could have a water balloon toss coupled with a sprinkler to give kids a blast while keeping them cool. If there is a little wiggle room in the budget, you can even set up a crafting space outside for kids to make bird houses out of popsicle sticks and glue, or make puppets with lunch bags, markers and some yarn. In Case of Bad Weather It’s always a good idea to have a plan b in the event of bad weather. Come up with a list of indoor activities that could keep kids occupied and having fun. For example, you could have a scavenger hunt and leave clues around the house with a prize at the end. You can tell stories as a group, having each child take turns to build a tale together. Or you can come up with a craft activity to keep the kids occupied. It only takes a little extra preparation to be ready in case of rain ruining an outdoor party. With a little planning, and a lot of DIY, you can throw a fun, inexpensive birthday party she’ll remember. Just remember to keep a few contingency plans in mind in case circumstances require a quick birthday party shuffle. The work will be worth it when you see her face light up on the big day. This yummy winter treat is so easy to make . Use as tabletop sculptures, seating cards or to dunk in hot chocolate. Kids love coloring the marshmallows and assembling the snowman or snowwoman. Best part for you? This pleasing project is inexpensive, not messy and requires minimal supervision. Why not create a whole snow family? Select one jumbo and two large marshmallows. Use toothpicks to attach marshmallows. Sprinkle plate with coconut snow. If you are looking for a unique idea for a boy’s birthday party, The Art Truck has the solution. Boys can create fantastic art projects in our one-of-a-kind mobile art studio. With several birthday party ideas to choose from, you are sure to find a theme that boys will love. With our Party Like Picasso Paint Bar, little Picassos can create works of art using primary and neon colors. They can take their masterpieces home and proudly display them for everyone to see. Boys love to build things, and what better than robots? 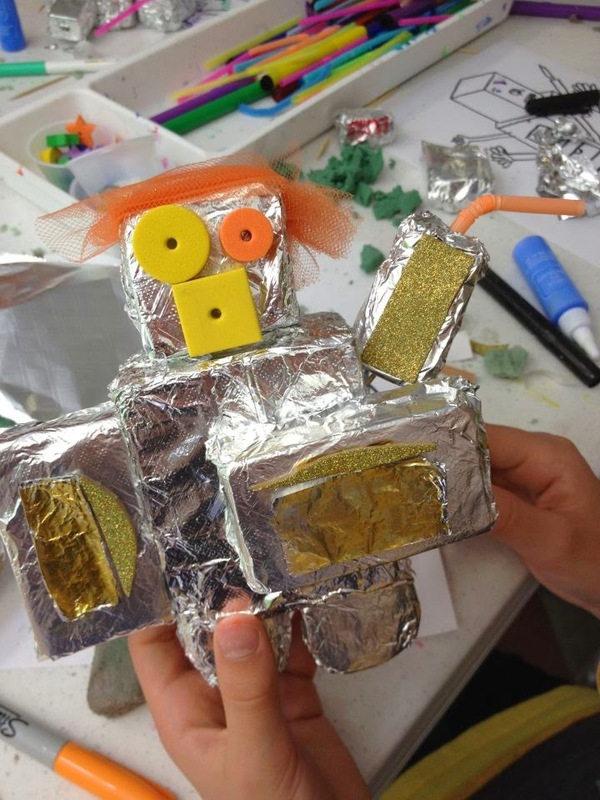 Children can create space-age robots decorated with shiny materials, complete with unique powers and personalities. Our Carousel Cowboy Party invites boys to decorate flying ponies using an array of materials. They can create individualized Western hats and act out their adventures. At a Fairytale Funtastic birthday party, boys can dress up as princes, knights, and wizards, complete with crowns or magic wands. Boys love to imagine that they are royals or wizards endowed with magical powers. What better way to create lasting memories than with photos? At a photo shoot birthday party, boys can dress up with costumes and props, including mustaches, goofy glasses, clown noses, bow ties, neon hair, hats, dog noses, eye patches, and more. They can frame and decorate their photos to create treasured keepsakes. What birthday party is complete without dessert? At an Edible Art party, boys can decorate cookies and cupcakes with delicious toppings. We will provide plates, napkins, and candles so you can end the party by singing “Happy Birthday” and letting your guests eat their creations. If you are planning a boy’s birthday party, The Art Truck is the perfect option. With an array of unique birthday party ideas, we will bring the party to you and help children express their creativity and forge lasting memories.